Our most popular begins at Deadman’s Bar located just below the scenic Snake River Overlook. The river runs smoothly here, through a pristine, natural landscape that features both a forested and open meadow environment. This special sanctuary is home to an abundance of wildlife, waterfowl and other bird life including the majestic bald eagle. 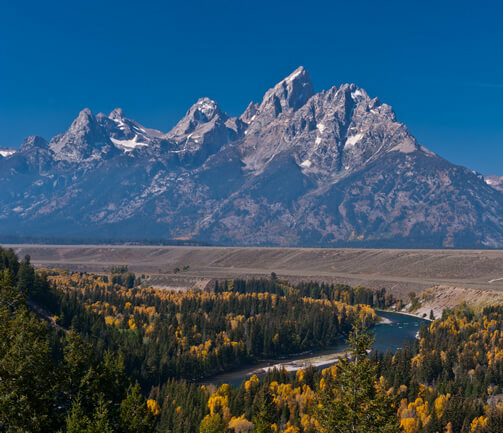 The most prominent and impressive peaks in the Teton Range are ever present above you. This trip is the perfect length (approximately 2 hours actual floating time) to fully experience a river adventure, enjoy beautiful scenery and view wildlife, all within the heart of the park.